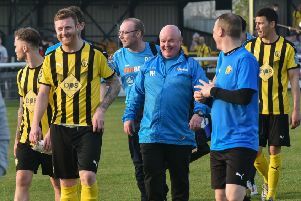 Leamington fought back from a half-time deficit for a third successive friendly at Townsend Meadow on Tuesday evening, writes Paul Okey. But whereas they went on to record 3-1 wins over both Worcester City and a Leicester City XI in their previous two outings, Racing Club proved an altogether tougher nut to crack, hanging on for a draw and a share of the Tony Horley Cancer Charity Cup. Tom James had an early free-kick deflected for a corner by the Racers wall but goalmouth action was a rarity in the early stages as the visitors struggled for fluency against their terrier-like hosts. Despite looking resolute at the back, Racing Club were struggling to get out of their own half and their opening goal in the 24th minute came completely out of the blue. Tony Breeden raced out of his goal to deal with a hopeful punt over the top but misjudged the trajectory and his header only succeeded in laying the ball on a plate for Louis Bridges who gleefully tucked it into an empty net. James came close to an equaliser in the 33rd minute, hitting the top of the home crossbar with Tom Cross stranded, while Joe Magunda’s header from a Rob Thompson-Brown corner was cleared off the line by Jack Taylor. John Blunsom battles it out with Stefan Moore. However, in truth, there was little to worry Cross as Leamington struggled to find a way through Racing Club’s massed ranks. A neat move down the left presented Bridges with a shooting chance seven minutes into the second half but, off balance, the former Southam United strike could only drag his shot tamely wide. Kurtis Revan, who was struggling to replicate his form of four days earlier, was unlucky not to win a penalty after being nudged in the back, while Martin Hutchcox did well to block a shot from Ahmed Obeng as Brakes began to look more threatening. A determined run and shot from Revan then brought out a parry from Cross with the ball rebounding dangerously into the centre of the area before being smuggled away. Joe Carter tries to prevent Revan getting in a cross. Both sides made triple substitutions just short of the hour-mark, with the introduction of Colby Bishop serving to pep up the Leamington forward line. A Cross clearance was partially blocked with Revan picking up the pieces but he was unable to direct his shot on target. A Bishop snap-shot from outside the area also failed to hit the target but it was indicative of a step up in intent from the Conference North side as they looked to preserve their 100 per cent start to pre-season. Racing Club substitute Luke Church then presented the visitors with a way back in the 71st minute, going dangerously high with a challenge on Obeng which had referee Martin Gittins pointing to the spot. Tony Breeden gets down well to deny Racing club Warwick substitute Luke Church. Thompson-Brown stepped up to send Cross the wrong way from the resultant penalty to bring Leamington level. Bishop had a fine chance to put his side ahead just a minute later but he was unable to guide his header from Obeng’s cross on target with the goal gaping. The striker then saw a shot cleared off the line by Jamie Vadasz. Church almost made amends for his earlier misdemeanour when he broke the offside trap and advanced on Breeden. However, he never looked confident and shot into the midriff of the Brakes skipper. With the game opening up, Cross was called on to block from Revan, while at the other end Breeden had to be alert to keep out Church after a clever through ball from Alex Price. A dinked cross from Richard Taundry was headed wide by Bishop and Mark Turton was also off target with his head for the hosts as both sides chased a winner. Bishop was then denied by the woodwork after twisting and turning in the box to get off a shot which was deflected past Cross. Courtney Baker-Richardson and Taundry both failed to trouble Cross with shots as the game entered the dying seconds. The home keeper was then relieved to see Taylor again in the right place after a Tom Rankin cross had been inadvertently headed goalwards by one of his own defenders. Racing Club Warwick: Tom Cross, Jack Taylor, Joe Carter, Martin Hutchcox, John Blunsom, Martin Slevin, Henry Leaver, Alex Price, Ryan Billington, Louis Bridges, Robbie Stevens. Subs: Ben Cranage, Adam Knight, Mark Turton, Jamie Vadasz, Luke Church, Jake Brown.